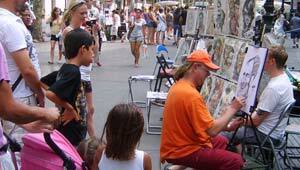 There is a saying that you can just about anything on La Rambla and as you walk along the street you can see why. Everything is on sale from newspapers to live chickens! Because it’s such a busy street, there’s always a good atmosphere too and we really enjoyed just walking along it with the family. The street is on a slight hill, but it’s so slight that it doesn’t really matter which way you walk it. However, you’re probably not going to want to walk all the way back so plan your visit accordingly. Nearest metro stops are Dressanes for lower La Rambla, and Catalunya for the top bit of the street. Whether you start or end your journey in Placa Catalunya, it’s worth spending some time in this giant public space. There are plenty of café’s to sit out and watch the world go bay and the impressive fountains are almost hypnotic.